You are a smart person. You are taking the time to read this article. TAKE TIME TO THINK. I wouldn’t be taking the time to say this if I didn’t think it was necessary. Hey – just make the right choice. It can be as simple as that. TAKE TIME TO THINK… then make the right choice. If you need further help. visit my website, as I have a whole section on who to call for the help you need. If you get what I’m saying and want to share your story with others to spark some change – visit me on Twitter and hashtag #TakeTimeToThink. Help inspire others. 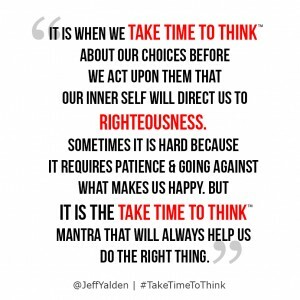 It’s when we TAKE TIME TO THINK about out choices before we act upon them that our inner self will direct us to righteousness. Sometimes it is hard because it requires patience and going against what makes us happy. But it is the TAKE TIME TO THINK mantra that will always help us to do the right thing. – Jeff Yalden is an international world-renowned youth teen motivational speaker. Have him speak at your school by contacting us here.